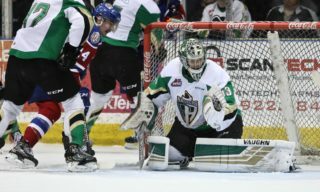 RAIDER REVIEW: The Raiders (44-7-0-2) wrap up their week-long jaunt through Alberta tonight at the ENMAX Centre against the Lethbridge Hurricanes (27-15-5-5). 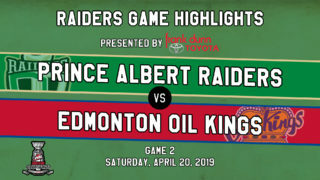 Last night in Calgary, the Raiders rolled to an 8-2 win over the Hitmen at the Stampede Corral in the final game of the Corral Series. Cole Fonstad led the way with two goals and three assists on the evening. Noah Gregor netted a hat trick and an assist. Dante Hannoun (1g-1a) and Brayden Pachal (2a) also had multi-point nights. 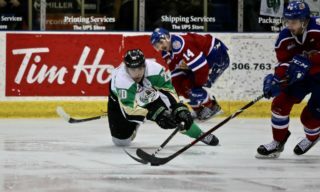 Eric Pearce and Sergei Sapego also scored for the Raiders. Ian Scott picked up his 31st win of the season by making 21 saves at the Corral. 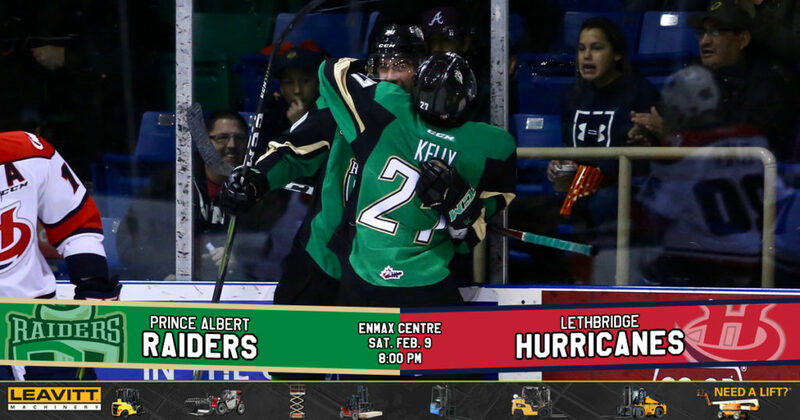 VS. LETHBRIDGE: This is the third meeting of the season between the Raiders and the Hurricanes. The Raiders won the first two games of the season by matching 5-1 margins. MONTGOMERY’S MILESTONE: Sean Montgomery set a new Raiders record on Friday night when he played in his 331st game with the club. The previous record holder was Brett Novak, who suited up for the Raiders from 2001 to 2006. FONSTAD’S FIVE: Winger Cole Fonstad recorded the first five-point night of his WHL career on Friday night at the Stampede Corral. His previous career high was three points in a game. It was also his seventh two-goal performance of his career. The Montreal Canadiens prospect now has 24 goals and 34 assists in 53 games played this season with 22 of those points coming in the past 16 games. GREGOR PULLS A TRICK: After taking 237 games to record his first career WHL hat trick, Noah Gregor now has two three-goal games in the past five contests. The San Jose Sharks prospect is now tied for the team lead in goals with 33 with Brett Leason. Gregor is up to 71 points on the season with 38 assists to go along with his goals. PEARCE BREAKS THROUGH: Eric Pearce ended a scoreless drought on Friday night in Calgary, finding the back of the net for the first time in 19 games. 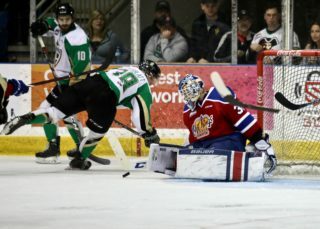 The Regina product’s last goal came on Dec. 14 in Swift Current against the Broncos. The goal was Pearce’s fifth of the season, surpassing his goal total from last year. NEXT UP: The Raiders head to Swift Current on Wednesday night to take on the Broncos (10-37-2-2) at the Innovation Credit Union iPlex. 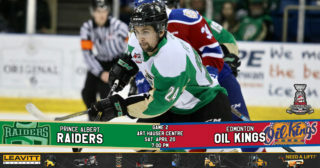 The next Raiders’ home game is on Friday, February 15 when the Brandon Wheat Kings come to town for a 7 p.m. start. Get tickets at raiderhockey.com and the Raider Office.